I have generally followed the World Economic Forum with interest over the past few years, particularly with regards to infectious diseases topics that feature on the agenda of the great and the good. Their perspectives are often different from the healthcare professionals on the ground, as the focus is primarily on global economics and trade, although in the past two decades the World Economic Forum has expanded to include first political and then civil society leaders among the attendees. Nonetheless, it is important to appreciate the spectrum of thought, in order to find common meeting grounds and potential paths to solutions for these problems. Tuberculosis, malaria, HIV and vaccines are recurrent themes at the WEF, and since 2012, the issue of antimicrobial resistance has been featured each year. Antimicrobial resistance was also featured in the Global Risks Report in 2013, which was a significant shot in the arm for increasing the awareness of this problem beyond dedicated healthcare professionals and researchers in the field of antimicrobial resistance. A new social Global Risk that was highlighted this year (no doubt in response to increasing news reports of Ebola, influenza and antibiotic-resistant pathogens in the recent past) is “rapid and massive spread of infectious diseases”. It is now perceived to be the second highest risk in terms of global impact, just behind water crises and ahead of weapons of mass destruction. I include a snapshot of the various Global Risks below, several of which (failure of urban planning, interstate conflicts, etc) also translate into a rise in infectious diseases if they do occur. There continues to be a session on antimicrobial resistance, this time titled “The End of Antibiotics”, with the speakers being Jeffery Drazen (editor-in-chief of the New England of Medicine – perhaps the most prestigious medical journal currently), Venki Ramakrishnan (Nobel Prize laureate in 2009 for his work on the ribosome), and Jean Carlet (who established the World Alliance against Antimicrobial Resistance). You can view the recorded session here. 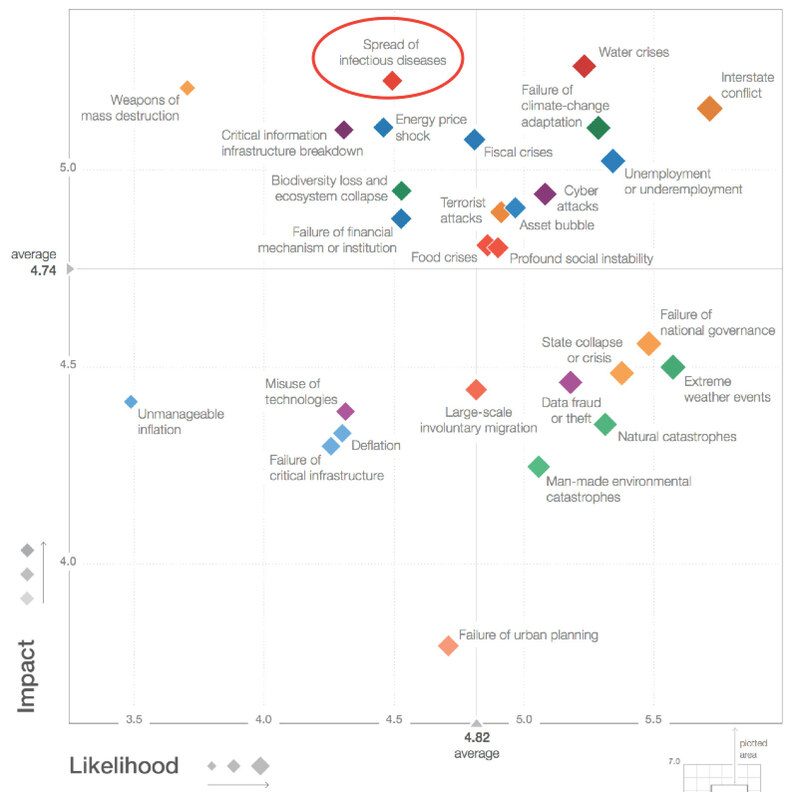 Global risks 2015 in terms of likelihood and impact. Obtained from the World Economic Forum Global Risks Report 2015.